In February 2015, I made a bold decision to move to the Amazon Jungle. I needed a sabbatical, time away to re-evaluate my life. I was intuitively guided to venture alone to Peru. When the lease was up on my luxury apartment in Boca; I put my belongings in storage, hired a woman to run my aromatherapy company and rented an adorable casa made of mud in a small village called San Roque. There was no hot water, indoor plumbing, television or internet. No restaurants, coffee shops or ATM’s. I found a new rhythm, lounging in a hammock, sipping tea while watching the rain fall peacefully in glistening drops. My days revolved around reading books on Shamanic plant medicine, walking down muddy roads, photographing lush scenery, practicing Spanish with friendly locals, writing poetry on the bridge by the river, listening to the sound of waterfalls cascading over rocks. I chased the iridescent blue butterfly through the mountains, but she always eluded my grasp. I scratched hundreds of insect bites all over my entire body, until my skin bled. I cooked simple vegan food on a propane stove with two burners. I got lean and strong from hiking every day in rubber boots. I watched men appear out of the dense foliage carrying bananas, papayas and exotic fruits I had never seen. On the days the sun appeared from behind the grey mist, families stretched out long mesh tarps and covered them with peanuts, coffee, and cacao. “Cacao what an interesting fruit” I thought! Deep crimson red and vibrant orange colored pods the size of footballs, containing the magical beans that the local women turn into chocolate truffles. Cacao, jungle peanuts and raw honey, all mixed together and rolled into delicious balls. I had never tasted such bliss, the creamychewy texture, the delicate sweetness, the rich earthy aroma. It only took one bite to change my entire life! The forces of fate began to reveal my destiny to me in that moment. I spent the next several months studying the traditional art of making chocolate from Peruvian Cacao. I learned the methods of organic agriculture by spending time on family farms and participated in the harvest. 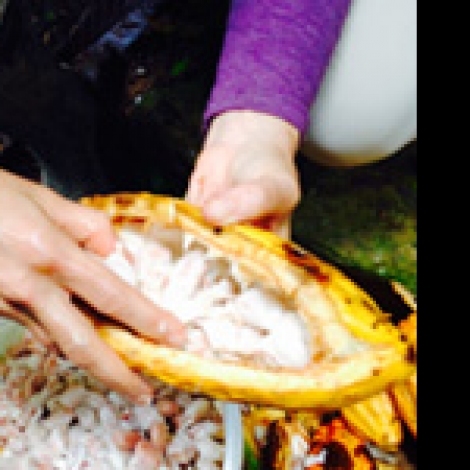 I researched everything I could about the cacao industry worldwide. I made friendships with proud farmers who give everything they have to the cultivation of their land and to earn a decent living. Many things were learned about life while in the jungle. Mostly that our connection to Mother Earth is essential for our health and wellbeing. The people in the Amazon may not be materially wealthy but they have a wisdom that can only be understood by living in harmony with nature. I saw how much I took for granted: things like long hot showers, having a washer and dryer for my clothes, buying every kind of food I desired. My educational background in botany and my passion for medicinal plants led me to study them in Europe, Asia, Central America and India. My heart opened wide to the farmers who labor so hard to bring us our food and medicine, yet most are unable to get medical treatments for their own families. Being in Peru not only made me appreciate my blessings, it inspired me to do something about the poverty that exists in our world. Kacao Amazonia is a community supported agriculture project, which I have founded in Boca Raton. I am representing a family farm in Chazuta Peru, selling their organic cacao products at the Boca Green Market starting November 7th. 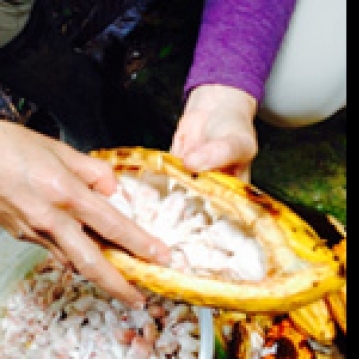 I am delighted to share my love of cacao with my local community and support a cause I believe in. My greatest lesson to share with you is to listen to the song of your soul and know that the dream you seek is also seeking you! Katie Haley is the founder of CosmicFlower Aromatherapy and author of “A Diamond for India.” She currently has a studio in Delray Beach offering private yoga, massage therapy and intuitive readings. Please visit www.cosmicflower. com or call 407 760-8214 for more info. When Are We Growing?Sport of KingsTwigs and Shout200% OF LIFEJust when you thought they weren't listening…Low Maintenance or Idling?